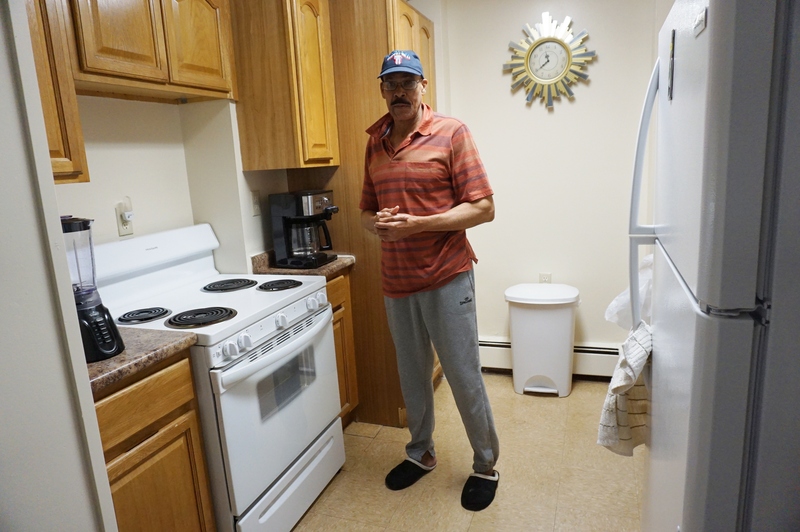 Livingstone Allen shows off the new kitchen in his apartment at Commons Senior, one of four senior buildings to undergo renovations. 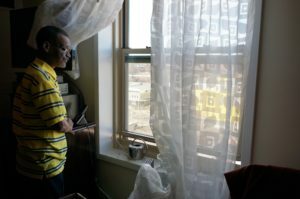 Douglas Homes resident Wayne Bullock looks out the new window in his living room. Commons Senior resident Livingstone Allen in his newly renovated bathroom. Residents living in four New Community senior buildings can now enjoy their newly renovated apartments. Rehab work is complete on units in Commons Senior, Douglas Homes, Gardens Senior and Roseville Senior, with only minor touch-ups being finished. Residents of the renovated buildings are happy with the results. “They did a fantastic job,” said Livingstone Allen, a resident of Commons Senior. The 69-year-old proudly showed off his newly renovated apartment. 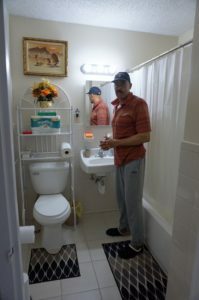 He received new appliances, a whole new bathroom, new closet doors and painted walls. Wayne Bullock, who is 61 and lives at Douglas Homes, said while the project was an inconvenience, it was well worth it. “They did a beautiful job and I want to give my appreciation for what New Community has done,” he said. Bullock’s entire apartment was worked on and he said the changes have been a big improvement. In addition to being more aesthetically pleasing, Bullock said the new windows were a big improvement because they keep out more noise and draft and they’re easier to lift, which is a big help for seniors. He also said his entire apartment is brighter since the work was done. The rehabilitation project encompasses both senior buildings and family units at the four Newark properties. Work on the family units, which began in 2018, is continuing. All work on the properties will be complete by the end of 2019. The entire project is meant to update and preserve NCC’s affordable housing. 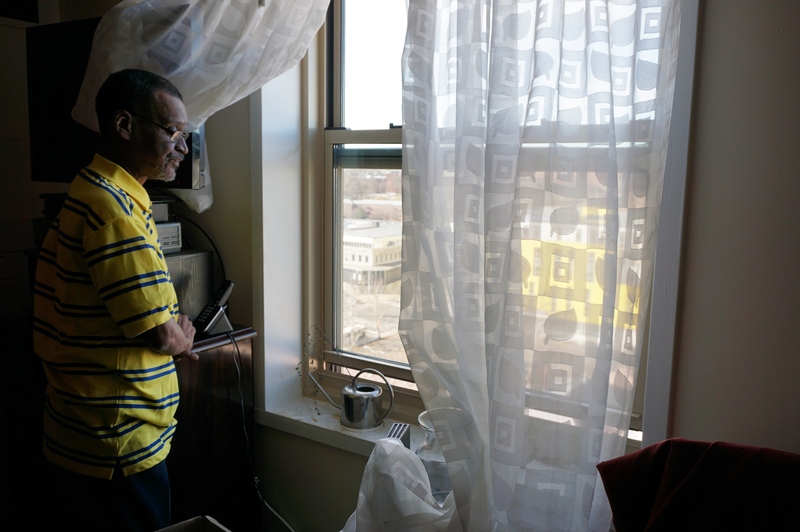 New Community worked with Greystone Affordable Development — a development and transaction management group focused on recapitalization, rehabilitation and preservation of affordable housing — to secure funding for the project. Claremont Construction Group is upgrading the interior and exterior of the properties. The rehabilitation work on the buildings includes roofs, boilers, lighting, elevators, underground piping and landscaping to better serve residents. Each unit within the properties will be painted and will be getting new closets and a brand new bathroom. Based on need, some units will have additional work done, which could include flooring, entry doors, light fixtures or appliances. 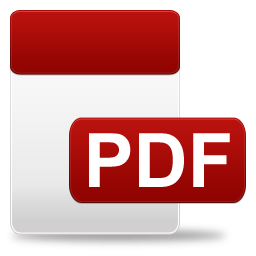 Residents who have questions or concerns regarding the project should contact their building manager.